At Marne-la-Vallée, a 45 minute train journey from Paris, you’ll find the two theme parks that make up Disneyland Paris, surrounded by hotels, restaurants and other services. It’s an easy day trip to take, but make sure you buy your park tickets in advance for the best prices. The two parks are the Walt Disney Studios and Disneyland Park and both are right next to each other just a short walk from the RER station. 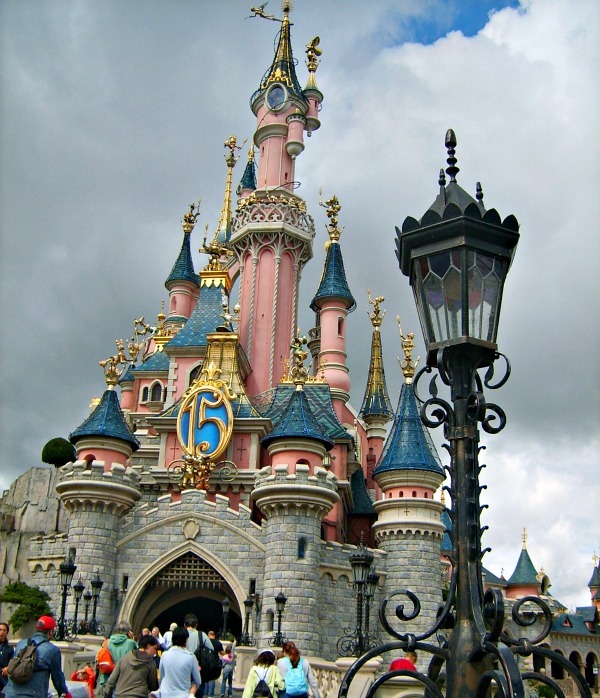 Disneyland Park is a replica of the Magic Kingdom with most of the rides you’ll find in the one in Florida set in 5 different lands surrounding Sleeping Beauty’s Castle. So you’ll find attractions like a particularly good versions of Space Mountain, Pirates of the Caribbean, Buzz Lightyear Laser Blast and the Big Thunder Mountain Railroad. At Disney Studios there are 4 different ‘lots’ each with their own attractions. Dominating the park is the Twilight Zone Tower of Terror with attractions like Crush’s Coaster, the Rock ‘n’ Roller Coaster and Toy Story Playland. There’s plenty to occupy your time for a full day at both parks really, but you can do the highlights of both in one day and it’s well worth the trip from Paris. This is an extract from our free Paris City Guide. 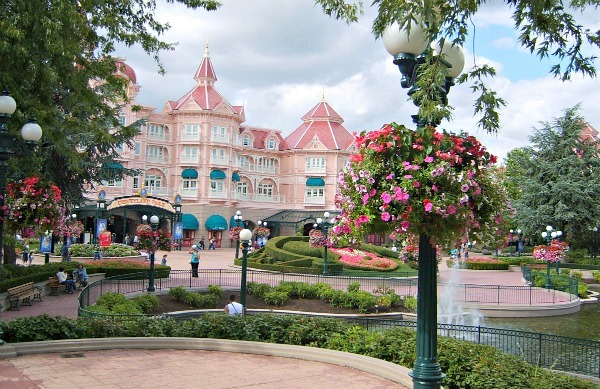 Disneyland Park – The entrance to the park leads you into the first of 5 different lands. Main Street USA is a traditional looking line of american stores from yesteryear and inside the buildings there’s all the Disney merchandise you could ever need, plus some food outlets. 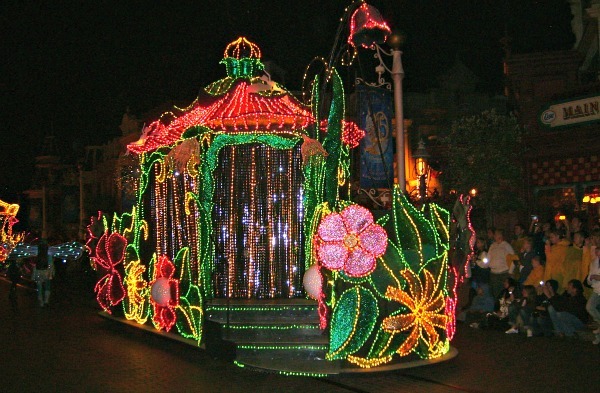 The street leads to a very pink version of Sleeping Beauty’s castle, which is tiny compared to the one in Florida, but is still a fitting centre piece for the park. The other four lands are grouped around the castle. In Fantasyland, there’s a whole load of rides and attractions for younger children based on make-believe like “It’s a Small World”, Peter Pan’s Flight and the Voyages of Pinnochio. Discoveryland embraces science and technology and has a great version of the Space Mountain roller-coaster along with a Buzz Lightyear ride whire you spin your car around and zap aliens and Star Tours, the experience based on Star Wars. Frontierland celebrates the wild west with the Thunder Mountain Railway as its main ride along with the haunted Phantom Manor and your chance to ride the steam boat. Finally, there’s Adventureland where you can ride in a runaway wagon in Indiana Jones and the Temple of Peril or enjoy the antics of the Pirates of the Caribbean. Add to that the parades and shows. All in all, there’s everything you need here for a great family day out and although it’s not an even match for the park in Florida, all the best bits are here. Walt Disney Studios Park – The main entrance to the studios brings you into the Front Lot and through a large movie sound stage with stores and characters. In the Production Courtyard you’ll find the main thrill attraction in the park, the Twilight Zone Tower of Terror. This ride takes you on a mystical journey through the Twilight Zone and then flings you up and down in a crazy elevator. It’s great fun, but not for the faint hearted! Also in this area is the Studio Tram Tour, where you see some of the production areas that are used by Disney for movie-making and a Stitch experience too. 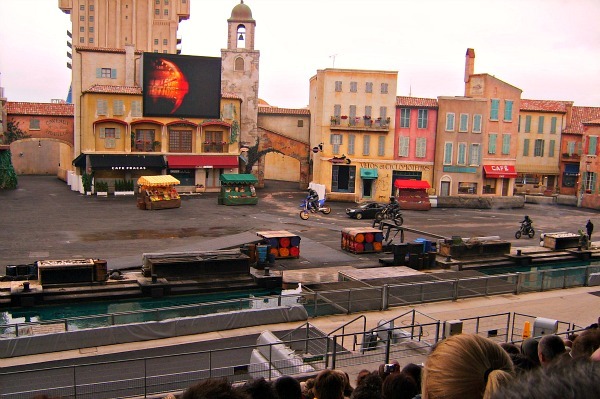 In the Toon Studio, there are lots of attractions based around Disney’s animated classics and in the Back Lot there’s a great car stunt show, an experience based on the movie Armageddon and the Aerosmith Rock ‘n’ Roller Coaster which is a favourite of ours. Outside the Disney parks is the Disney Village which is free to enter and sometimes has entertainment. You’ll find lots of major restaurants here, but most of them we wouldn’t recommend eating in, as the food in our experience was over-priced and poor quality. The best meals we had were at Cafe Mickey and inside the Disneyland Park at Walt’s on main Street USA. To get to Disneyland Paris, take the RER A (red route) from central Paris to Marne-la-Vallée. You can buy your ticket at the automated machines (which speak English) or at the counter where there’s a good chance the operative will speak enough English to get by too. A single adult ticket is around 7 Euros (2013 prices). The first time we visited from Paris we had a ‘Paris Visite’ 3 zone pass, which meant we only had to buy a ticket for the remaining bit of the journey to zone 5, although we had to get off and validate the ticket at the first station of zone 4! Also just make sure you’re on the a train heading to the right destination as the Red RER route splits in two. The train should say Marne-la-Vallée on the front and the screens will indicate where each train’s destination is too.